Ben Byam invites public to visit his sugar shack. 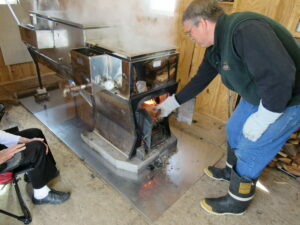 Ben Byam adds wood to his maple syrup boiler at his sugar shack on Route 2 at Rumford Point. RUMFORD POINT — Ben Byam produces maple syrup as a hobby, not to make a living. Visitors to his sugar shack on Route 2 enjoyed sampling his sweet product during Maine Maple Sunday. Byam said he has been boiling sap since he was 5 years old. After selling syrup from his home for awhile, he began using the Byam Family Sugar Shack, built in 2012 by building trades students from Maine Vocational Region 9 in Mexico. The start and end to his sugaring season depend heavily on the weather, he said. For example, tapping this year began March 20. In 2018, it was March 1 and in 2017 it was Feb. 27. “You boil when you can and shut it down when you have to,” he said. The Byam Family Sugar Shack on Route 2 at Rumford Point. He invites the public to visit his sugar shack this season. “If you see the light on, come on by,” he said. 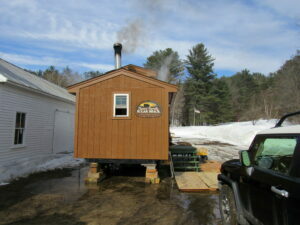 For more information on Maine’s maple syrup industry, visit mainemapleproducers.com.